Much maligned as the unsavoury cousin of spicier and more glamorous Thai food, real Cambodian cooking is unfortunately under-appreciated by many visitors to Cambodia, although this is hardly their fault. 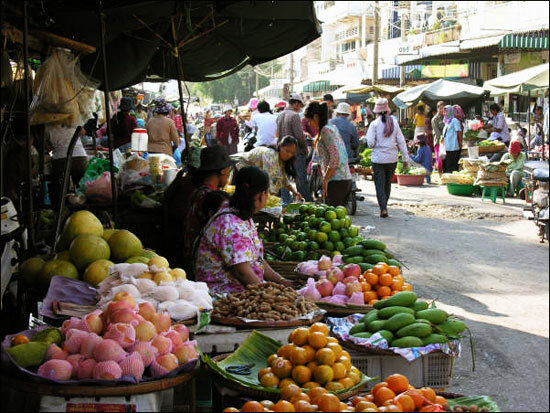 Cambodian food uses what's local and what's in season. Rivière, former executive chef at the Hotel de la Paix and author of the book Cambodian Cooking, now runs Cuisine Wat Damnak, which he has dedicated to bringing genuine Cambodian cooking and ingredients to diners. Like Thai food, the aim is to introduce the different flavours of sweet, sour and salty, though less of the spicy. With Cambodian food however, these flavours are often introduced through the range of dishes on offer and not necessarily within the individual dishes themselves. Of course, for restaurants that are catering to large numbers the constant change that that implies is simply not possible and this is the main reason why tourists are not exposed to Cambodian cooking as Cambodians experience it. But that doesn’t mean that it’s impossible, and Cuisine Wat Damnak is one place to start. In Cambodian food, the most common spices and flavourings are lime juice, fish sauce, fish paste (prahok), kaffir lime, galangal, turmeric, garlic, lemon grass, and tamarind. And the most common dish that visitors will encounter is the renowned Cambodian fish amok, with its rich, coconut milk base. You’ll find this being served in restaurants all over town though, but according to Rivière, the best one in all of Siem Reap is to be found at The Sugar Palm restaurant on Ta Phul Road.